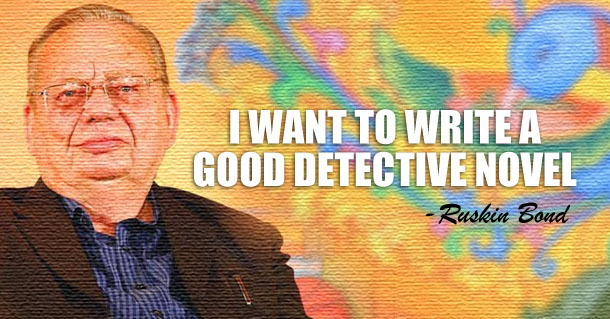 Ruskin Bond wrote his first book at the age of 17 ever since he has uncountable works credited to his name, in various genres like short stories, novels, poems and essays and the most loved author now wants to try his hand at something he hasn’t done till now – a traditional detective novel. “Occasionally I have written about stories related to crime but I have never attempted a traditional detective story. So I want to write a true detective story,” he said in an interview. On his 84th birthday on May 19, he came out with his latest book Ranji and the Music Maker which was published by Penguin Random House imprint Puffin India. The book is about young Ranji who once in the middle of his languid holiday, stumbles upon assorted musical instruments in the storeroom – first a shrill flute, then a blaring little trumpet and, finally, a too-big drum that may have once sounded a battle march. “When I ventured into writing at the age of 17, I wanted to be a good and successful writer. I just wanted to write good stuff – poems, prose, stories, essays, everything”,says Bond. Let’s wait for his Detective Novel !